Steve Kinniburgh is hoping there is more magic to come for Corby Town in this season’s Emirates FA Cup after they stunned higher-ranked Alvechurch with a 4-1 away success in their second qualifying round clash. 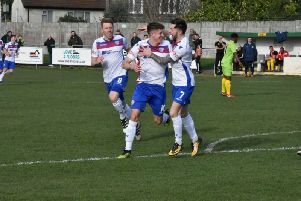 The Steelmen’s superb form at the start of the campaign continued as Joel Carta hit a hat-trick and Jamie Anton was also on target to help seal an impressive victory. Corby will now take their place in the third qualifying round draw tomorrow (Monday) lunchtime. And Kinniburgh believes his team’s character was there for all to see once again. “It’s a tremendous victory,” the Steelmen boss said. “We came up against a very good side. They moved the ball around well so I challenged the boys over what we needed to do to be at the next level and for us, it was a really good challenge. “It was a question of how we dealt with stopping the gaps and counter-attacking them and, to a man, I thought we did it absolutely brilliantly. “We have got good character in the squad where everyone is fighting for each other. “All over the pitch they are working and fighting for each other and it’s a fantastic dressing-room. “For everyone associated with the club, to have now won three FA Cup games this year is magnificent. “And to be in the hat again, for the club and the feelgood factor, it’s just brilliant. “Everyone working hard in the background deserves to be in this round where the clubs and attendances get bigger. It was a day to remember for Carta, who has been a revelation since joining the club in the summer. The midfielder has now hit nine goals in all competitions so far this season. And Kinniburgh added: “We have seen it coming from Joel. “You can see all the attributes he’s got without even going onto the field. You add in his goalscoring, the way he gets around the pitch and the way he looks after the ball. “He’s one of many who have started the season well. He’s only 20 years old and we have given him the chance to step up. Kinniburgh also had a special word of praise for the Steelmen fans who were on hand to cheer their team on to the fine success. He said: “The fans add a massive atmosphere at grounds where the crowds are low. “We had our 70 or 80 rocking it behind the goal. They give us something to hang on.